Me, Beloved, and a friend had dinner at Food Camp. No, this is not a military-style food encampment. However, I find the name appropriate for the place which serves mostly sandwiches and hamburgers—food I would expect scouts would carry around. Our friend has been here a few times, and claims this is among the best burger he had the chance to try. Sold by that statement, and since Vikings was an impossible venture at a weekend without a reservation, we went. Their menu is pretty unique for a sandwich place, since they focus mostly on burgers. They also appropriately name their burgers using the phonetic alphabet. Their patties are all 1⁄3 pound ones, and you can stack as much as you want. 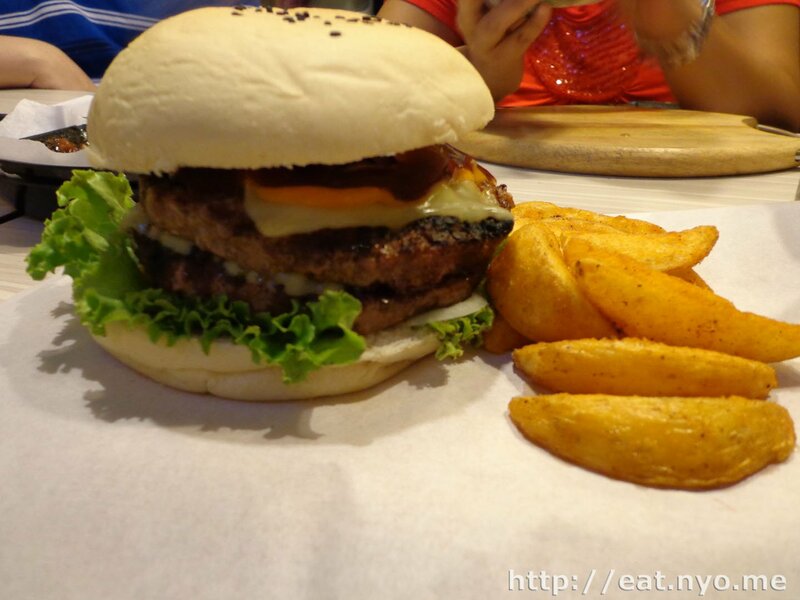 Beloved noticed a special burger on their menu, and ordered that: their Wagyu Burger (359 Php for two patties). 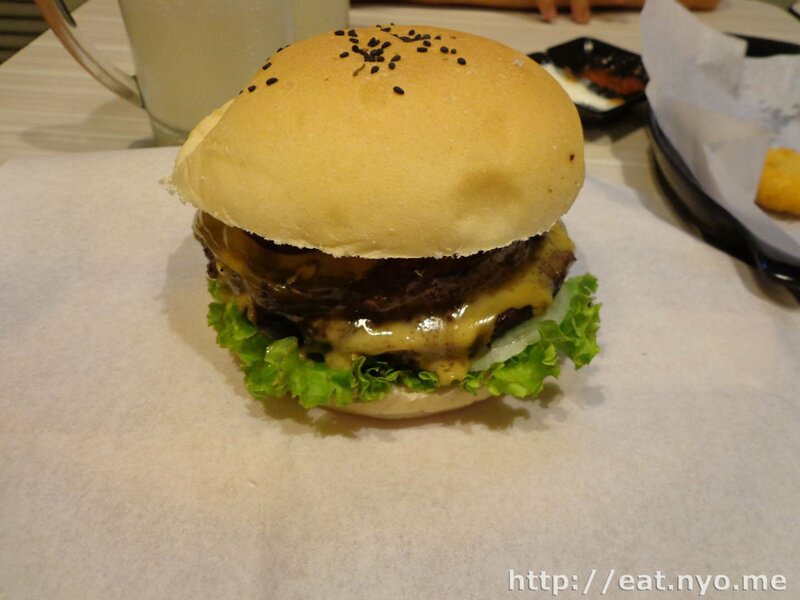 Although that was also enticing, I ordered their Bravo Burger (250 Php for two patties) to be different. Our friend, who was a veteran to the place, ordered their Filicheese Steak Sandwich (115 Php) and their Charlie Burger (175 Php for one patty). For sides and drinks, we ordered their Jalapeño Sticks (79 Php),** Mozarella Bomb** (109 Php), and a couple of Vanilla Milkshakes (85 Php). 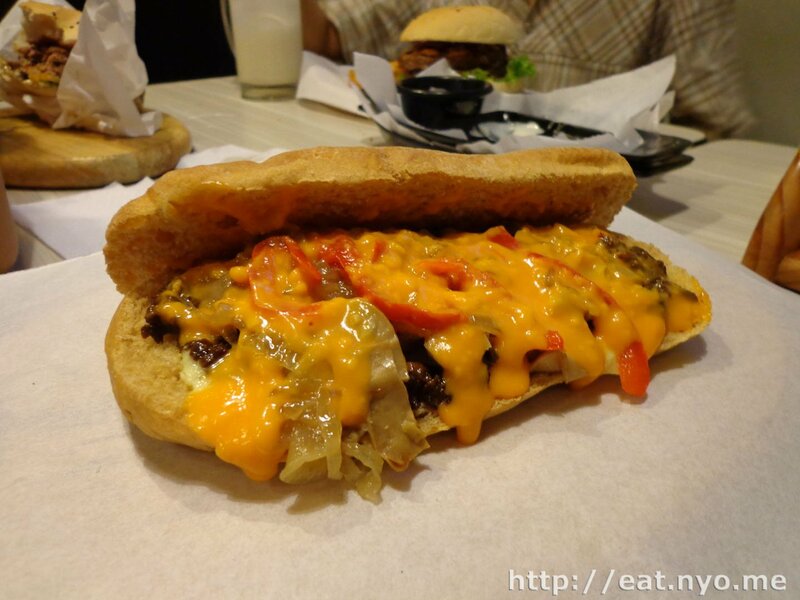 Our appetizers were quickly dispatched, but our burgers and sandwiches were the stars. So I’ll start with mine. This is the Bravo Burger, served with potato wedges. I’ve had my fair share of double third pound patty burgers before, but this one looked and felt bigger. Aside from the obvious ingredients of meat, lettuce, and cheese, it also had a sauce made with bacon and mushrooms, which was why I ordered this instead of their Alpha or Charlie. How was it? It was pretty awesome. The meat was very soft yet still firm, and very juicy. Although this doesn’t topple my favorite burger joints, this might just be a close runner up. My only complaint is if you don’t eat it quick enough, it gets a bit try, but which burger isn’t? The potato wedges, on the other hand, don’t really compare to my favorites, although it was okay. I’m sure Beloved liked this kind—very soft and fluffy on the inside. Beloved’s Wagyu Burger was looked and felt similar to mine, minus the potato wedges. However, the meat used here was much softer, juicier, and had that melt-in-your-mouth factor that mine sadly didn’t have. It didn’t have the delicious mushroom and bacon sauce that mine had, but it certainly didn’t need it. I’ve had a share of bad wagyu burgers before, and this is how you cook up a good one. Our friend’s Filicheese Steak Sandwich had a thin layer of meat spread over an elongated bread smothered in melted cheese. For the price, it certainly looked appealing, and the satisfied look on our friend’s face certainly looked like it was all worth it. His Charlie Burger, not pictured since it looked pretty much like my burger minus a patty, was similar to my burger minus the sauce plus the meat having melted mozzarella in it. That wasn’t the entirety of our orders. Above is their Mozzarella Bomb. There was actually five of them, but this one had a better picture. 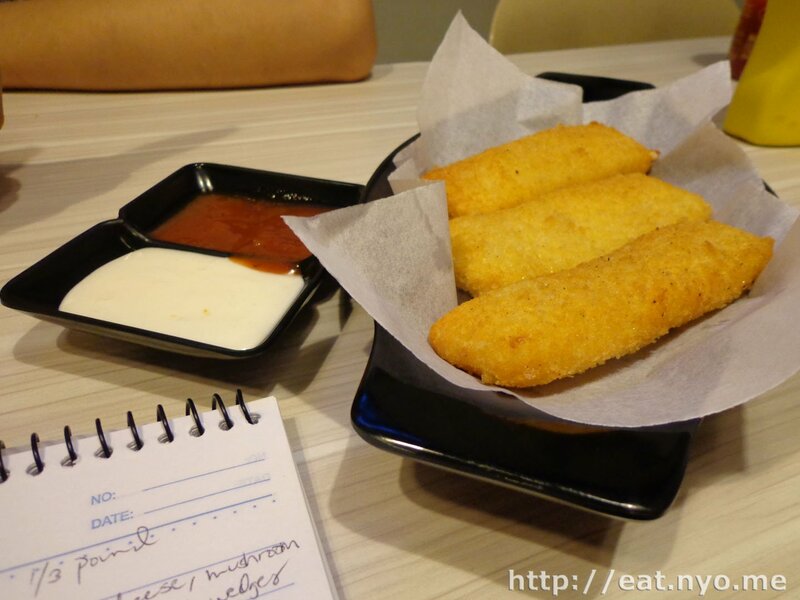 These were essentially deep-fried breaded mozzarella sticks served with ketchup and garlic sauce. The latter sauce was pretty good for this. Beware: despite their seemingly small frame, they are pretty heavy. This was probably the better appetizer: their Jalapeño Sticks It’s pretty similar to Brickfire’s Jalapeño Cheese Sticks. The only difference is the stalks were removed and this was a bit milder in my opinion, perhaps because there was much more cheese in this one. It was also served with the garlic sauce that went pretty well with mozzarella. 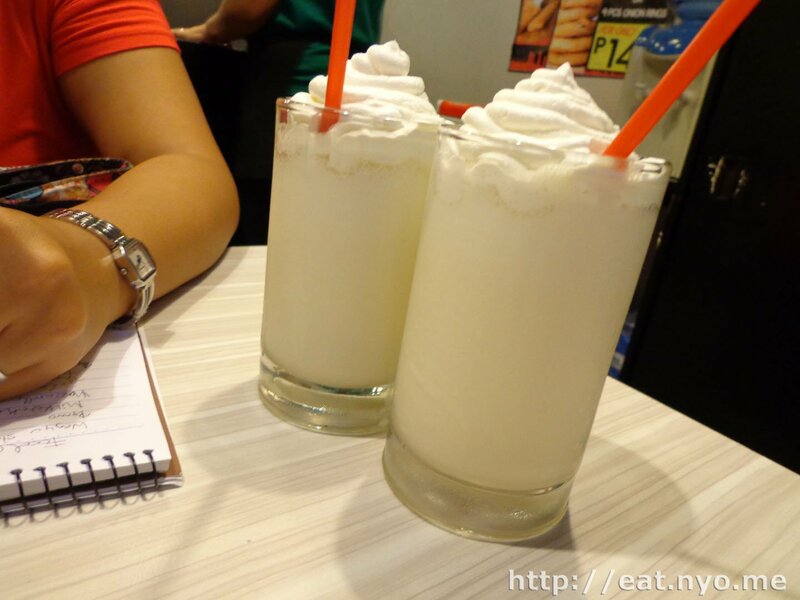 Oh, and, Vanilla Milkshakes. Although certainly not of Starr’s quality, they receive no complaints from both me and Beloved here. The downside to this place for Me and Beloved is that it’s located at the hard-to-commute part of Katipunan, over the Aurora flyover, where no jeepneys pass by directly. Although I do know a commutable way, it’s not as direct as the directly-commutable side. Despite that, pound for pound, the value here is pretty good. It also managed to cook wagyu, a meat I’ve had the opportunity to cook recently and found out how difficult it was, pretty nicely. I might want to go back here to try out an entire Wagyu Burger for myself, since I only had a few bites. All in all, Food Camp was awesome. Location: Katipunan Ext., Quirino Hospital side. Not recommended for: Stuffed Serfs. 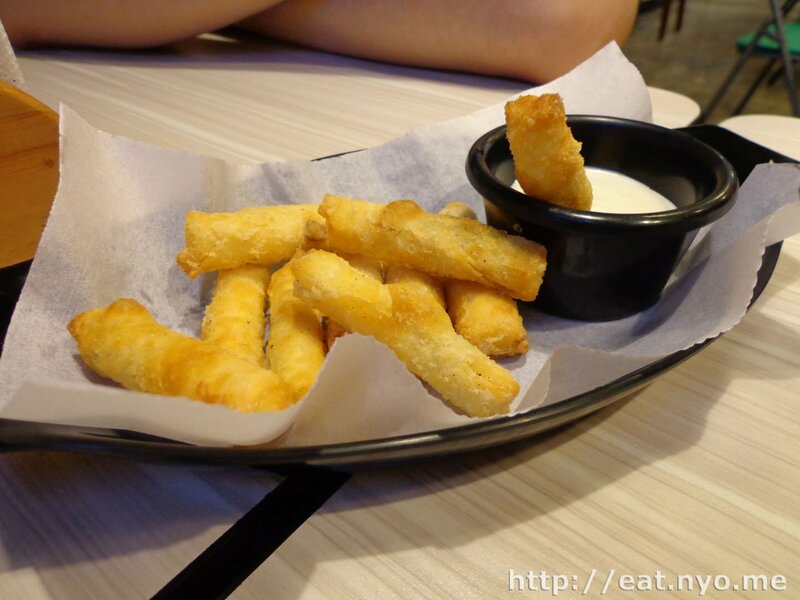 Smart nomnomnom tip: Their appetizers aren’t appetizing; they make you full. Beware if trying out a burger with more than one patty.